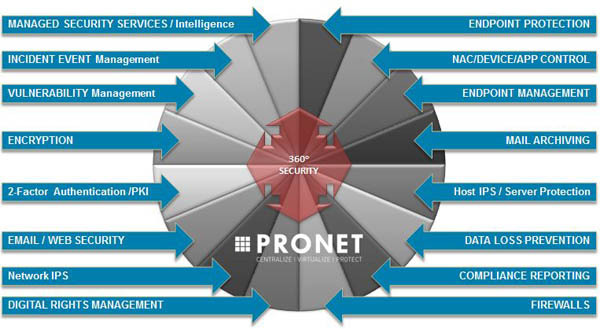 The 360° SecurityFor 20 years we are leaders in IT solutions. 20 years of experience dealing with security issues, are enough for us to witness that security is not only a box attached on the network switch or the activation of policies and filters that come pre-installed with the hardware. Security is first of all, the awareness you should have of the potential today’s threats and then, a combination of: people involvement, consideration of processes and knowledge of what technology could offer for protection today. While our in-house team hold accreditations across all the vendors we work with (as you would expect), we also invest heavily in industry certifications such as CCNA, CCNP, CISSP and CISA to ensure our engineers and consultants can provide far more than just product expertise, in order to assure you that can go beyond an Antivirus software, a Firewall and an IPS protection..! customized "solutions that work" for all of your security demands no matter how complex they are!